First Sentence: A single line of blood trickles down the pale underside of her arm, a red seam on a white sleeve. Reason for Reading: The comments made by fellow book readers made me curious and so when the book was selected as a group read for one of my online book groups, I decided to give it a try. Comments: The novel begins in July of 2005, set in the Pyrenees Mountains, as the main character, Alice, is drawn to a cave where she finds two skeletons, an altar, and what appears to be the pattern of a labyrinth. She soon finds herself in the middle of an ancient mystery—one where a secret long protected now risks being revealed. There are people who wish to uncover the secret and use the power that the secret holds for their own purpose, one woman in particular who seeks power more than anything else. Another seeks to destroy what is kept hidden and he will kill whoever stands in his way. As Alice’s story unfolds, memories of a life many centuries before are like shadows in her mind. Her present is linked to the past, to the story of Alaïs, whose tale is also told in the pages of Labyrinth. Alaïs’ story begins in 1209 in Southern France, on the eve of a terrible crusade to rid the lands of heretics and the like. Intendant Pelletier, Alaïs’ father, takes her into his confidence and tells her of a secret he has long held dear. He puts in her safe keeping a ring and coin, inscribed with a labyrinth, which will identify a guardian of the Grail. She later is given a book that must not fall into the wrong hands. It is one of three books, which had been kept separate for safe keeping, each hidden and kept by a guardian of the Noublesso de los Seres. As Carcassonne begins to fall, it is up to Alaïs to keep the secret safe. I have heard much in the way of negative reviews about this book and a scattering of positive ones. I had no trouble following the story or keeping the characters straight, which were common complaints made. I found the story mesmerizing, full of suspense as well as drama. Although toted as another story of the Holy Grail (which in this novel offers a fresh and different twist to the original stories), this novel really is so much more than that. It is a story about love, betrayal, conspiracy, faith, murder, and sacrifice. I was most drawn to the historical story in the novel, reading about the history of the times as well as Alaïs’ story. The cruelty of the crusaders, the massacre of a people kin to genocide because of a difference in religious beliefs, bled from the pages. My heart went out to the Cathers and Jews, as well as others who did not quite fit into the fold of the Catholic Church during that time. Alaïs’ character touched my heart—her strength and unfailing sense to do what was right were admirable. It was her story that most captivated me. I like to see strong female characters in leading roles, and Labyrinth had several. Labyrinth was a book I found best read in quiet moments where I could dedicate my full attention to it. This is definitely a book to savor. The author’s writing style is very descriptive and at first I worried this might detract from the book, however, it suits the mood and tone of the book very well. 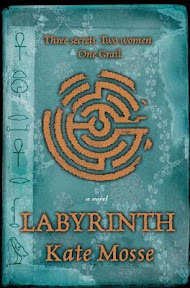 Labyrinth is not a fast paced thriller, nor is it an easy read. It has a depth that comes more often to literary fiction than a suspense novel. It is a novel rich with history and heart. Favorite Part: The historical portion of the story most intrigued me. I know so little about that time period, including about the Crusades. Alaïs and Sajhë were my favorite characters—they both were such honorable people. Their dedication and sacrifice was admirable. Although at first I wasn’t sure about him, Alaïs’ husband, Guilhem du Mas, earned by respect by the end of the book. His heart was in the right place. Miscellaneous: Occasionally a book I’ve just finished leaves behind a sort of afterglow that I can’t quite shake. And this was one of them. I truly loved the story and it not only earns a perfect rating from me, but it also is among my top two reads so far this year.